Given the ensemble cover here, I expected the issue to start off right in the middle of things as Bane consolidates his power and establishes himself as the major threat in Gotham. We kind of do get to see that, but in a bit of a roundabout way that I didn’t like so much. We are still somewhat in a “prequel” phase here, given everything that happens. I’m sure that the 6-issue mini-series will pick up its pace soon since there isn’t a whole lot of time before the entire Forever Evil event ends, but the pace really needs to pick up. I want to see the war actually happening, and not be treated to cameos of the villains one after another. Which is kind of what this issue is all about really. We see Bane make his landfall in in Gotham, we see him break open Blackgate, we see things from Scarecrow and Pyg’s perspective. We see a lot of things happen. And some of these things don’t have a proper context, such as when Scarecrow meets up with Mayor Penguin and the latter, while in the middle of a lecture to the former, gestures to a map of the city in certain places and then correspondingly those locations get blown to hell. It mimics a certain scene in The Dark Knight Rises in which Bane’s League of Shadows forces blow up all the exit and entry points in and out of Gotham, such as the bridges, etc. I’m not sure what happened there. And given that the entire event is happening divorced from the rest of the comics, the main monthly titles, it creates confusion. But all the same, I really enjoyed seeing everything that’s happening in Gotham. It is, on the whole of it, really exciting stuff. 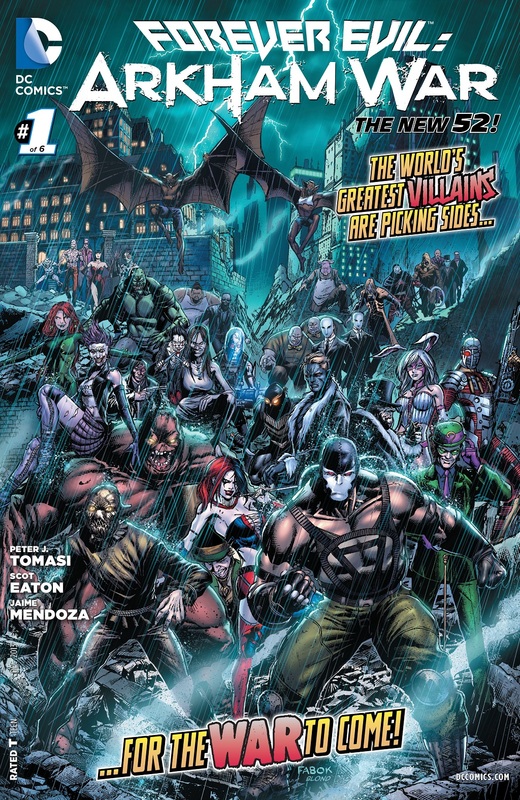 In the absence of the Batman, with Nightwing a prisoner of the Crime Syndicate, the Teen Titans missing from this reality altogether and the location of all the other Gotham-centric heroes unknown, the city will be torn apart in this battle between Bane’s Santa Priscans and the Arkhamites. There is the potential for a really good, really epic conflict here and I’m hoping that Peter J. Tomasi delivers on the goods. Apart from his Two-Face #1 issue last month, none of his Villain’s Month scripts were all that good, but he is bouncing back, if this issue is anything to go by. With regards to the artwork, we have Scot Eaton on the pencils with Andrew Dalhouse on the colours, Taylor Esposito on the letters and the trip of Jaime Mendoza, Norm Rapmund and Mick Gray on the inks. Together, these six artists deliver on a really good, really atmospheric comic. Everything works together, whether its the pencils or the colours or the inks or even the letters. Lots of big action scenes and lots of moody stuff here, each and every thing reflecting on the characters in those panels. The utter physicality of Bane is always on display, for example, and he is always a centerpiece in his panels. Great stuff really. The one negative in this book is that I don’t like Scarecrow’s design. His visual design changes every single time he’s in a comic. I don’t know how he was in the previous Batman titles for the New 52, but in everything to do with Forever Evil, his look is incredibly inconsistent. So that’s really it. This was a decent first issue, but I want more out of it. I want more jazz, more rock, more metal. Posted on October 10, 2013, in Comics Reviews, Review Central and tagged Andrew Dalhouse, Arkham War, Comics, Comics Reviews, Forever Evil, Forever Evil: Arkham War, Jaime Mendoza, Mick Gray, Norm Rapmund, Peter J. Tomasi, Review, Review Central, Scot Eaton, Taylor Esposito. Bookmark the permalink. 9 Comments.